Great location Clean place to stay abeit the design was a little outdated (like the 1908s, especially the AC). Great location to stay at with visible sightings of deers and kangaroos. Amazing view, surrounded by wildlife Our family had a fabulous stay. Woke up to find Cockatoos waiting to greet us. Kids loved the fact that there were kangaroos & emus in the gardens too. 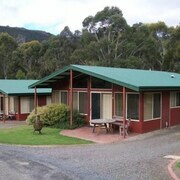 Situated in the mountains, this motel is 0.1 mi (0.1 km) from Grampians National Park. Great motel and exceptional price. Very close to the centre of Halls Gap. Cleanliness is important to me and this motel surpassed my expectations on that front. Only thing was that the bed was pretty hard so not the modt comfortable sleep but otherwise highly recommend! Comfortable cabin that is well accommodating. Cabin had everything required for a comfortable stay right down to a personal Webber BBQ and a garlic crusher in the kitchen. Cabin was quiet and warm (winter visit). The wildlife is right there for all to experience. Staff were friendly, approachable and knowledgeable on the local area. Comfortable place close to everything you need Lovely accommodation..the owners seem to take pride in what they do..everything you need at your doorstep..will stay again when in the area. Thank you for a lovely experience. If you need somewhere to lay your head for the night in Grampians National Park, Australia, there aren't too many places available. 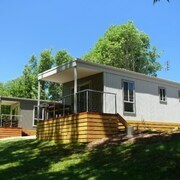 However, lastminute.com.au has loads of digs to pick from if you travel further out. 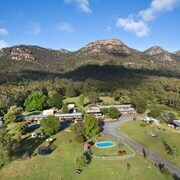 There are 31 various sorts of accommodation within a 30-kilometre radius of central Grampians National Park. Just think of the drive as a little extra sightseeing! Has all that sightseeing tired you out? 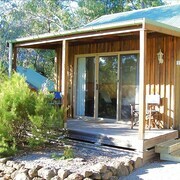 Jump into bed and relax at DULC Cabins or Grampians Getaway Resort. They're about as close as you'll get to central Grampians National Park. You might also like to check out your options at the Comfort Inn Country Plaza Halls Gap or The Grampians Motel & The Views Restaurant. Unfortunately, there are only a handful of budget accommodations for money-savvy travellers. Of these, Halls Gap Lakeside Tourist Park is up there with the best. 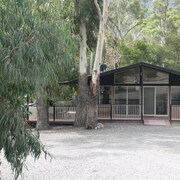 You might also like to check out the Kookaburra Motor Lodge or the Lake Fyans Holiday Park. 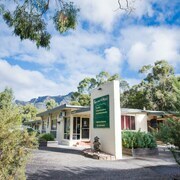 The Kookaburra Motor Lodge is 16 kilometres away from the centre of Grampians National Park, and the Lake Fyans Holiday Park is 25 kilometres away. We'd also suggest the Aurora Manor Rooms and the Aurora Cottages. The first is 20 kilometres away from town, while the second is 20 kilometres away. If you still have itchy feet, why not get out and explore more of the Grampians region? Among Grampians' gorgeous natural wonders are its lakes. After you've gotten all zen in Mother Nature, check out history museums and art galleries. If the weather is putting on a show (or even if it's not), you could also get out there and try out some popular local pastimes like rock climbing and mountain climbing. Beer or champagne? 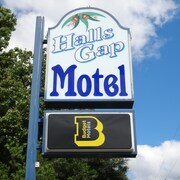 However you prefer to roll, you'll sure to love a trip to Halls Gap, 17 kilometres away. With Red Rock Olive Estate and Brambuk The National Park & Cultural Centre to check out, you're not gonna be bored. 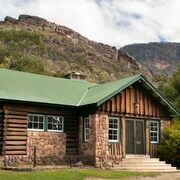 Some of our recommended Halls Gap accommodation options are the Grampians Eco YHA - Hostel and Pinnacle Holiday Lodge. Or, you could consider staying in Stawell, 40 kilometres to the northeast of Grampians National Park, where you'll find the Comfort Inn Goldfields and Diamond House Heritage Restaurant and Motor Inn. If you're staying in Stawell, set aside some time to check out Arboretum and Old Lake Oval. Arrived at Stawell Airport? Feeling a bit gross after the flight? Don't stress. Shampoo and towels are available nearby at the Coorrabin Motor Inn. If you can't get a room there, suss out the London Motor Inn. It's also super close to the airport, which sits 35 kilometres from Grampians National Park's centre.